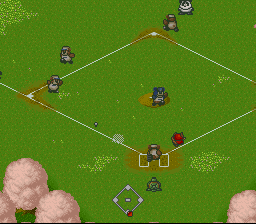 Zoo Ball is an unreleased game planned for release in the US by American Technos. The game was going to be a localization of Dolucky no Kusayakiu. Thanks to KingMike for the scans. 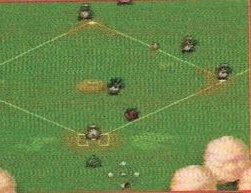 Zoo Ball is an unreleased baseball game featuring animal characters as players. 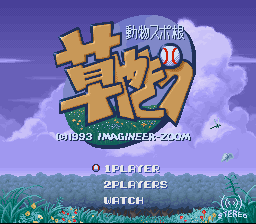 The game was going to be published by American Technos, though the Japanese game was released by Imagineer and Zoom (as Dolucky no Kusayakiu). Why American Technos decided to localize this is unknown, though maybe they figured it would appeal to younger players. 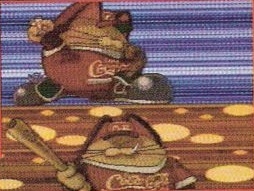 The screenshots found in the April 1994 issue of EGM clearly shows the Japanese version of this game. They described the animation of the game as "cute" and the sound as "funny". Batter up! 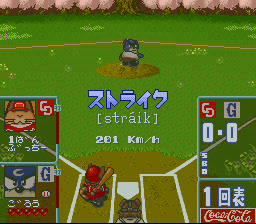 Note the interesting spelling of the word "strike" Fielding the ball. As you can see from the pictures above, the screenshots from the EGM preview probably came from the final version of the Japanese game. 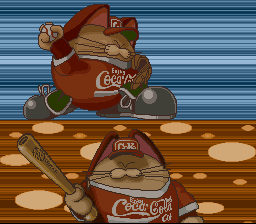 There appears to be a lot of shilling for Coca-Cola in this game. One would assume that it would have been very cheap to localize this with their logo plastered everywhere in the game. Perhaps that was another reason for its demise?